Fobus holsters and police gear were designed especially for the Israeli police and SWAT teams. The lightweight law enforcement supplies produced by Fobus are sure to be the next wave in tactical police equipment. Fobus holsters feature rapid deployment and perform in all situations and are virtually indestructible. Fobus holsters are mold injected with RX18 polymer, a compound of polymers designed for durability and high performance in tactical use. By using a passive retention system, a safety strap or mechanism is no longer needed, the Fobus holster design ensures safe carrying of the gun, accurate fitting and a quick draw when needed. A 100% lifetime guarantee stands behind each and every Fobus holster. This Fobus paddle holster has grown in popularity due to its comfort and lightweight construction. Like this very much especially the self locking feature. Very comfortable to use. Secures the weapon well but allows for an easy draw. I like the way it rides when I sit in a car and the gun does not dig into me. The paddle could be a touch more comfy, but I use it to carry daily. Love the holster. Great fit and deal. Recommend to anyone who needs a paddle holster. Outstanding weapon fit and fit like a glove on my hip. Love the Fobus self locking paddle holster. I have two a belt and paddle and don't leave home with out them. It is a great fit for my Ruger LC9. I have 4 stars because it is not as tight a retention as I would like. Good tight fit on waist band. Ruger SR9e was tight in holster, no play. Very comfortable to wear all day and holds my Ruger close to my body. Great fit. Both on belt and pistol. Hard to draw at first, Took a while to brake in. Really like the fobus holsters. My second Fobus holster and I really like it. I carried a Glock 17 in a Fobus holster for 10 years. When I needed a holster for my Makarov, I immediately looked to the Fobus. Shipping was fast and arrived in the allotted time. Thanks Copsplus. Awesome Got it when they said and works great. This holster is exactly what a wanted, fitment is perfect and comfortable to wear. Shipping was fast. Great site to purchase from. 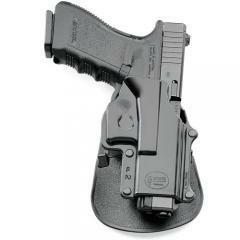 Will a G17L work in the g17 model? It should work but the slide will protrude out due to it being longer. I have a Taurus PT 247 PRO 45acp, not the G2 but the previous model. Will this holster fit it? It fits all Taurus pro models.